$32,679. Base price of this car is $27,200, and this sample came to us chock full of options-over $7,00 worth, in fact. That brought the final price to $32,679. This all-around favorite Toyota SUV has 176 horsepower that is derived from a 2.5 liter 4 cylinder engine. The vehicle is a 6 speed automatic transmission; front wheel drive. All-wheel drive is optional which ours is. All supported by sturdy 18" alloy wheels. This vehicle, while not built to be a powerhouse, is a solid contender for getting about in inclement weather. Power comes from a 2.5-liter four-cylinder engine that produces 176 horsepower and 172 pound-feet of torque. You will find that the six-speed automatic transmission is standard, and you can choose either an all-wheel drive model or you can get the front wheel drive version, and either one, we think, will be a great choice for you. 24 city miles / 31 highway miles Fuel mileage rating is 25 mpg overall, 22 city and 29 highway, and you can save $1,000 in gasoline costs over five years compared with other products if you buy a RAV4. The car uses 4.0 gallons of gasoline per 100 miles, and the annual fuel cost is $2,100 annually, based on 15,000 miles of driving yearly, with $3.55 per gallon gasoline. Toyota remains the leader in best selling and most reliable vehicles. The Rav4 now approaching 20 years on the market is a dependable, reliable crossover. Built for unanimous appeal, the Rav4 remains a good buy. Many other brands and crossover SUV's are encroaching the Rav4 now, so it is in very crowded quarters. This is now an uphill battle for Toyota as market share is depreciating. The car? Built sturdily for 5, it remains tried and true, roomier, and all the features are included. The car is a pillar and very dependable. Easy to get in and out as its not so high off the ground as its competitors. 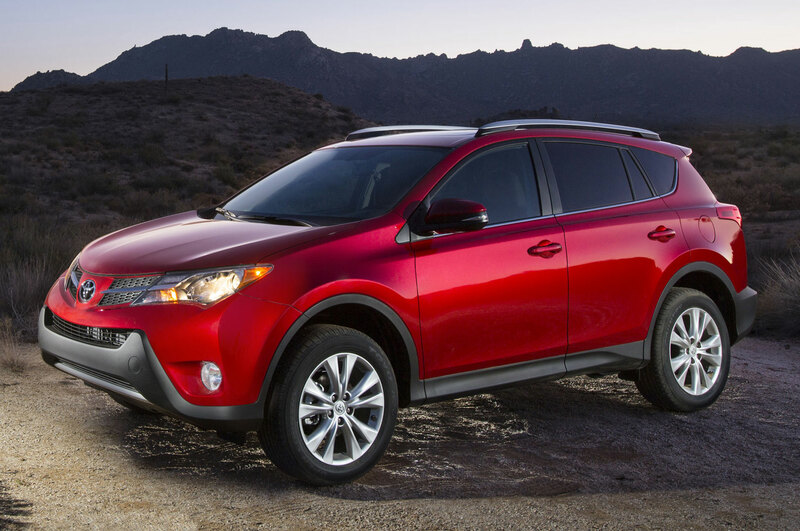 The RAV4 does just about anything you ask it to do, and does it without any fuss or stress. But the ride, especially if you have the larger tires and wheels and you bought a Limited version, can be bump, especially when you have the larger tires and wheels. Not terrible, but definitely noticeable. The RAV4 is now what it always has been, a dependable, solid, no nonsense alternative for middle America. But I wonder how much more the RAV4 will continue to hold its own, given the rapid developments and changes underway with many of its competitors, which have all remodeled and freshened up their products more quickly and comprehensively than RAV4 can offer. It also offers only one choice for an engine, and the RAV4 no longer offers a third row seat option. The Nissan Rogue, Jeep Cherokee and Ford Escape are all likely choices for people who compare before they buy. Terrific safety features include blind spot monitoring, rear cross traffic alerts and lane departures warnings - all this make a difference. Assisting the driver in getting customized drive is the tilt and telescopic steering wheel and a 8 way adjustable driver's seat (heated, of course). A rearview camera and cruise control are also included. Heated side view mirrors and anti-glare rearview mirror for night driving. Automatic high beams are the best - no longer a need to put your high beams on - the smart car knows if no lights are coming in the opposite direction and will courteously flip on for you. AS soon as a beam of light from an approaching car is in view, it goes back to regular beam. Very excellent Doppler weather keeps you apprised of any changes to climate and temperatures. Predictive traffic assists in avoiding traffic jams and optimizing travel time. Among the safety features you will get as standard equipment, are antilock disc brakes, a rearview camera, stability control, traction control, whiplash-reducing front head restraints, front-seat side airbags and full-length side curtain airbags. A driver knee airbag is also standard. We also like that the rearview camera is standard no matter what version you buy, and if you like, and you choose to purchase a Limited, you can get an optional Technology package on the Limited that gives you blind-spot monitoring, rear cross-traffic alerts and lane departure warnings. 6 speaker audio system, Bluetooth, iPod integration, a USB port and a 6.1-inch touch-screen display. Keyless entry and push button start. 11 JBL speakers in 7 different locations for kick "around sound" listening to your favorite Sirius satellite stations. AM/FM Radio. Mp3 and USB port with ipod connectivity. A power lift gate allows the driver so much flexibility to open the car while having hands/arms full of children or groceries, etc. Toyota's easier-to-use Entune infotainment system, includes HD radio, voice recognition, Bluetooth streaming audio and app integration and connectivity. You can get your RAV4 in several versions, including LE, XLE and Limited. The LE comes standard with 17-inch steel wheels, automatic headlights, power folding mirrors, keyless entry, rear privacy glass, full power accessories, air-conditioning, cruise control, a tilt-and-telescoping steering wheel, a 60/40-split and reclining second-row seat, a rearview camera, Bluetooth phone and audio connectivity, and a six-speaker sound system with a 6.1-inch touchscreen, a CD player, an auxiliary audio jack and an iPod/USB audio interface. The XLE adds 17-inch alloy wheels, foglights, heated side mirrors with integrated turn signals, roof rails, a sunroof, dual-zone automatic climate control, sportier front seats, a cargo cover and extendable sun visors. The audio system is upgraded on the XLE to include satellite radio, HD radio, traffic and weather. An option package allows you to add a navigation system and Toyota's Entune smartphone app integration to the XLE. The top-level Limited comes with all of the equipment mentioned for the other models, along with 18-inch alloy wheels, a height-adjustable power liftgate, keyless entry and ignition, an auto-dimming rearview mirror, a leather-wrapped steering wheel and shifter, an eight-way power-adjustable driver seat with memory settings, heated front seats and premium synthetic leather upholstery. Options on the Limited include a navigation system bundled with a premium 11-speaker JBL audio system. The Technology package adds a blind-spot monitoring system with rear cross-traffic alerts, a lane-departure warning system and automatic high-beam control for the headlights. That Entune system package is pretty comprehensive, by the way. It includes a Premium JVL audio system with navigation that was particularly terrific, a touch screen that can be split for a divided display, MP3/.WPMA playback capability, USB 2.0 port with iPod connectivity, Predictive traffic and Doppler Weather Overlay and Sirius XM radio and Gracenotes Cover Art, included, and there are other features as well that are part of this package that are too numerous to mention. Toyota's updates have helped as the Rav4 is universally attractive. Roof rack, cross bars, and updated grille and exterior contours make this appealing. The new liftgate has added to the design dimension - so the oldschool swing door is now history. And the spare tire is now found in the basement of the vehicle. It's a nice looking CUV, but even with the update, it looks somewhat dated, and I don't think you can afford to have a product in your model lineup that is just okay and pleasant in today's market. 3 year/36,000 miles Basic warranty; 5 year/60,000 miles Powertrain warranty. Three years/36,000 miles basic warranty; five years, 60,000 miles powertrain warranty.